The modular Diesel Production Units (DPUs) or so called Mini Refineries offered by LOHRMANN are complete, modularized units ready for immediate installation and are designed to be fully erected and operational within two weeks from arrival at a prepared project site. All equipment is fully warranted for one full year. Each DPU is custom designed to satisfy the user's unique requirements. The yield of diesel varies in accordance with the unique characteristics of the crude oil feedstocks. The units can generally be operated with a minimum turndown of fifty percent (50%) of maximum throughput. This rough-cut hydrocarbon will generally be blended back with the residuum and re-injected into the crude pipeline. This product can be used as a heating oil and fuel. The unit will produce arctic, winter and summer grades of diesel, depending upon the quality of the crude. The remaining crude, which is heavier than diesel, typically begins to boil at about 287°C (550°F). This product is generally blended back with the naphtha and re-injected into the crude pipeline. 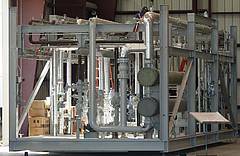 LOHRMANN can also furnish any optional equipment needed for further processing of the intended product streamssuch as Distillate Hydrotreaters, Catalytic Reformers, Vacuum Units and Naphtha Stabilizers.